Mark April 1 in your planner—that's the date IKEA's new Stockholm line launches in stores and online. If you can't wait until then, don't worry. Today, the brand released the first photographs of the collection, giving us a glimpse at the serene, Nordic-inspired line. While the first iconic Stockholm collection launched in 1984, the latest installment reflects a modern Scandinavian aesthetic. "This collection has much more light wood in it, with rattan and ash replacing walnut," says Viveca Olesson, creative leader at IKEA. One of the standout items is a woven light wood cabinet with brass handles, a piece design bloggers have already put on their wish lists. The collection also provides a bold prediction for the next It color: Nordic blue. Olesson describes this new color schemes as a "dark, Nordic blue that's inspired by our water, which is always cold—even in the summer time." 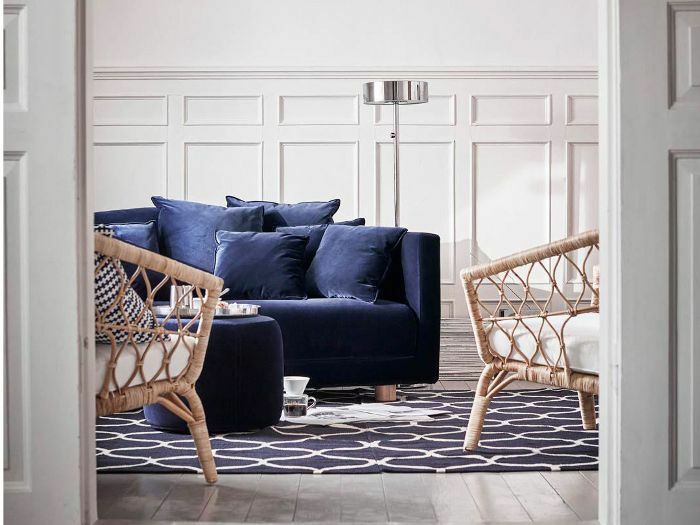 If IKEA is right, you'll start seeing a lot more of these deep, oceanic blue in furniture and home accessories. Take a look at the new Stockholm line, ahead of its April 2017 launch. This woven cabinet is one of the clear standout pieces in the collection. Chrome accessories pepper the predominantly wood and glass line. Unsure how to incorporate Nordic blue into your home? These glass vases are a good place to start. If you're ready to commit to color, this rich blue sofa is the perfect statement piece. What do you think of IKEA's new Nordic-inspired line? What's on your wish list?